Summer is officially a week away! We hope your summer is filled with fun travels, staycations, and other relaxing summer plans. If you are keeping up with our blog from home or some far away destination, we have a new ‘Before & After’ project in Barton Creek that we think you will really enjoy! It is quite a dramatic transformation. 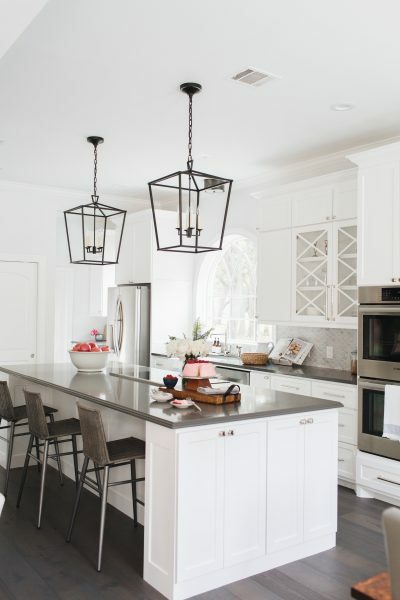 The homeowners of this Barton Creek home had a list of priorities for renovating their main living spaces, which included maximizing space and making cost efficient decisions to optimize the look and feel of their kitchen, family and breakfast room. The homeowners wanted their new kitchen to be beautiful, but also practical and comfortable for themselves and their 4 children. A family of 6, with 4 children under the age of 10, definitely needs space and practicality! For the next few weeks, we will be touring the kitchen & family room remodel project. We will start with the kitchen as this is the space with the most dramatic change. 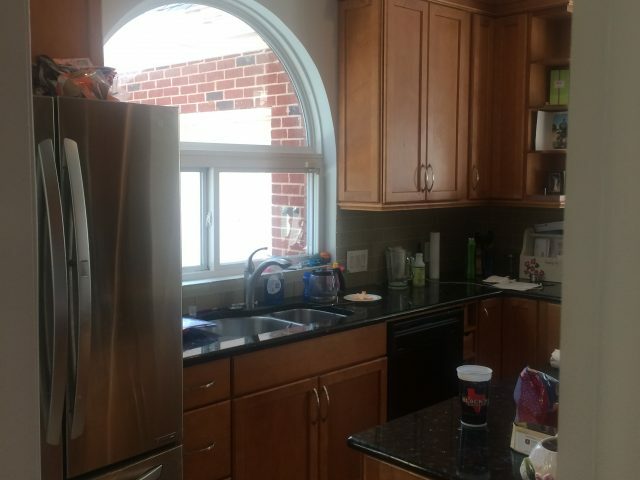 In order to truly appreciate the transformation, you have to see the before kitchen photos. To get an idea of what the kitchen looked like before, here is a view of the layout and finishes. The kitchen finishes looked dated. The layout and overall design dwarfed the room. 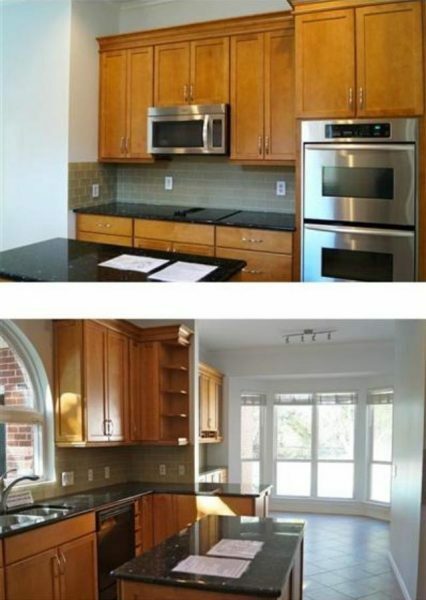 The kitchen was also mismatched from the bright, transitional spaces that surrounded it. It simply was not that functional for a family of 6, but with the proper planning, layout, and finishes this space could certainly become the beautiful and functional space our homeowners wanted. It almost doesn’t even look like the same space! One of the main goals of the project was to make the kitchen open up to the family room to create one open space for the main living areas. That required knocking down a wall and reconfiguring the entire kitchen layout. We also modernized the kitchen with new white kitchen cabinetry and dark Ceasarstone quartz countertops in Raven Grey. The dark slate grey countertop requires minimal care and maintenance. Perfect for a large family that plans to really use the space! The only existing element that we incorporated into the new design was the arched window over the sink. We kept the frame, but added a new farmhouse arched window. It is a pretty focal point and brings in a lot of character to the bright new kitchen. So much light pours into the space now. 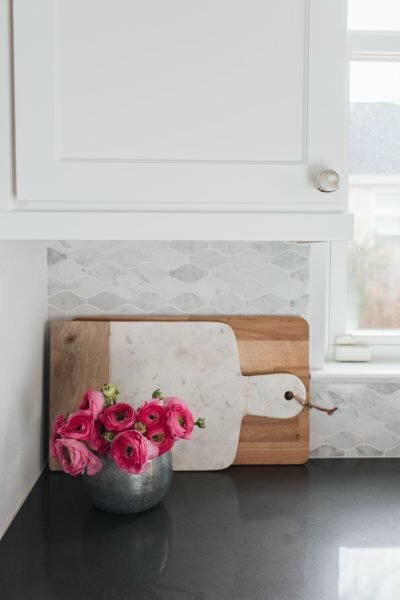 Carrara white marble backsplash tile adds to the timeless look of the kitchen. 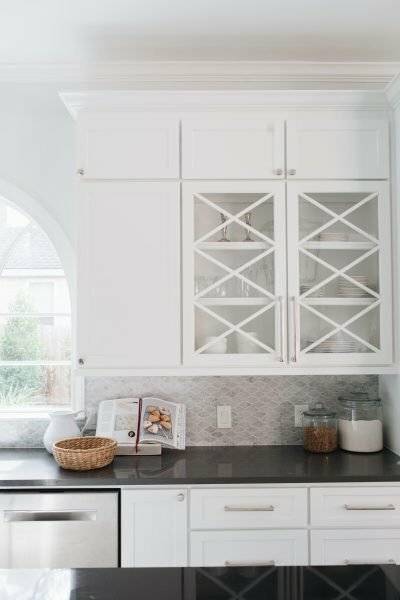 The mix of gray and white in the marble pairs nicely with the bright white cabinets and the contrasting slate gray counters. Here is closer view of the marble backsplash. 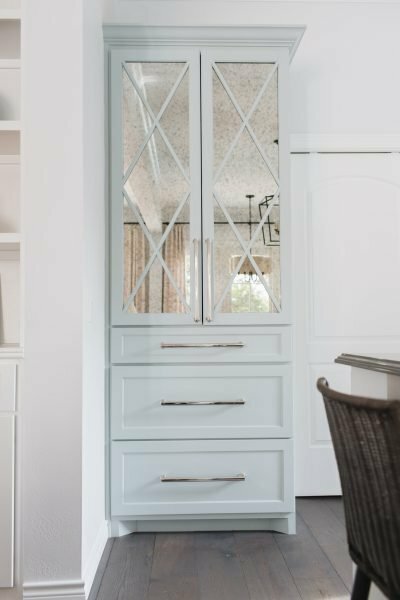 Another custom element in the kitchen is the pale blue pantry. It looks more like a custom furniture piece than a pantry! Antique mirrored fronts allow the items in the pantry to be hidden, but the mirror adds to the open feeling to the space. It also brings another special detail to this renovated kitchen and a cheerful pop of color. Not but not least, let’s talk lighting! 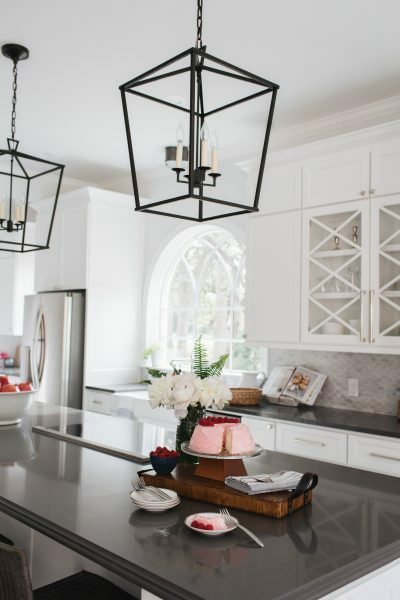 Aged iron pendants are classic for a kitchen. We love the clean lines. Plus, since they are open, they make the space feel even larger and do not obstruct any views. Home renovations can be overwhelming and intimidating but with the proper help and guidance from a professional, your design goals can be that much more attainable. 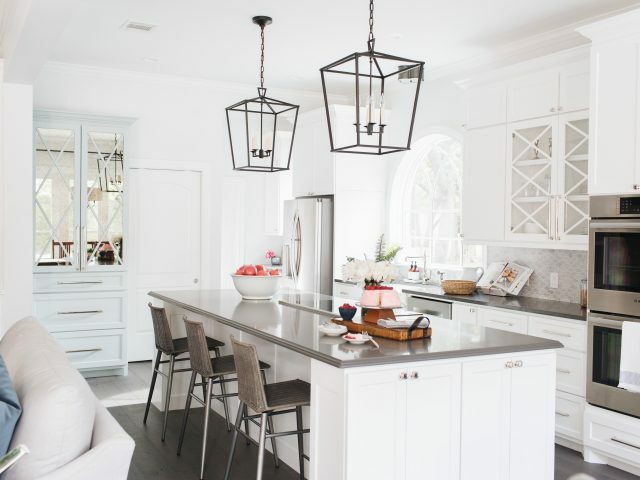 One of the most requested spaces to remodel is the kitchen. It is where you spend most of your time and where dated finishes begin to show their age. 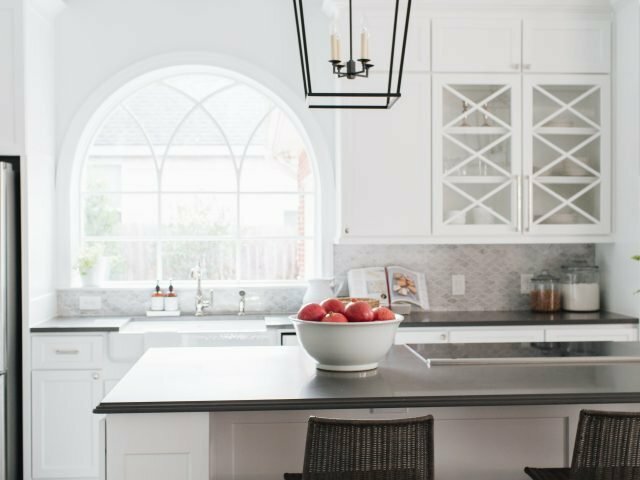 There are so many pieces of the puzzle to creating a seamless kitchen design, that hiring a designer should be a major consideration for your remodeling plans. They can save you time and money so that you don’t end up making expensive errors and rookie mistakes. If you are in the planning stages of your own kitchen project, let our team help. Fill out our questionnaire and we will talk through your project goals! Next week we will tour the breakfast room that sits right next to this bright, happy kitchen. I live in the same neighborhood with this exact same floor plan! So fun to see what you did with the space! Beautiful! Glad you enjoyed the blog! It does give you a fresh perspective and ideas!